Hi there! Great to see you back. Today I am running as Captain Obvious. No, nothing to do with lycra or super powers. All the stuff you are about to read, you already know. 100% logical and makes perfect sense. You ready for the first one? Sure? "You only get out, what you put in." This message is a simple one and again, one you've known all of your life. 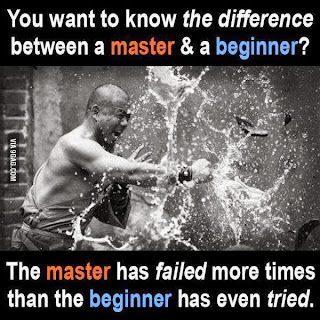 No one just becomes a master, an expert or even something more than what they were, without the positive benefits of failure. Yes, you read that right. The POSITIVE benefits of failure. Let's look at the facts and the combo of both statements. "You only get out, what you put in" and "the positive benefits of failure"
We all start out as beginners, amateurs and newbies in everything we do. Combine this with the first fact - effort - and it is in failure that we learn how to do better as it is one of the most efficient methods of learning. By trying something, we often fail at it first. If we don't try, not only do we never fail, but we also never grow, improve, or even learn. Failure is something we experience from birth onward. The trick is to view it more positively than negatively. For every failure where you put in effort, you get to choose what to do with it. 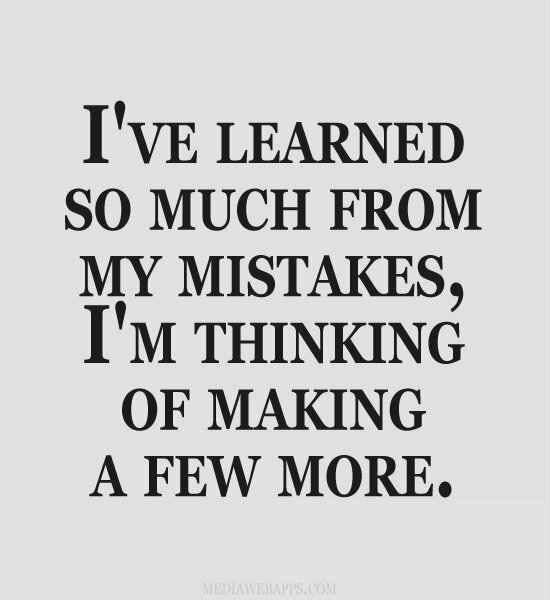 Above the line thinkers learn from it and aim to never make the same mistake again, they gain experience and grow. Below the line thinkers ignore the lessons and potentially screw up the exact same way later down the track, plus they often avoid the chance to make any more mistakes. 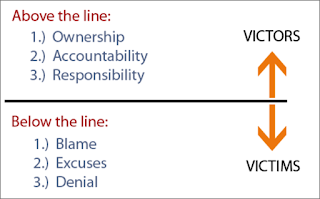 The vast majority of you reading this will be identifying with more above the line than below. But there have been times where you fell below the line, right? That's okay too. Most everyone does from time to time. If you are picking below the line as your most preferred and attractive option, perhaps you need to re-evaluate yourself and the way you view the world. These articles are designed to help you get above the line and stay there. Success and positivity always rule and flourish above the line and by learning from your mistakes. Ignoring any great lessons failure can teach you, will set you up to obtain a narrow view of the world around you and potentially fail. Perhaps not a good place to come from. If you do nothing else today and you live below the line, consider what might change if you challenge your beliefs. A positive view as a person can change your world. A positive view as a leader of people can change others worlds too. When it comes to mistakes, there is a caveat. I am currently a department manager leading (indirectly through a great up and coming Team Leader) a customer care team of 17 people, plus working alongside a fantastic team of team leaders in a mentoring capacity as part of a larger across-the-business solutions focused role. 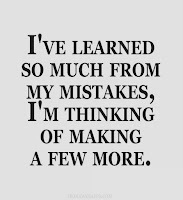 There are a lot of people who could be making serious mistakes. Now if each of these people made a mistake on an hourly basis and I did nothing about it, then I wouldn't be much of a manager/leader at all, or be helping the business or them as individuals. 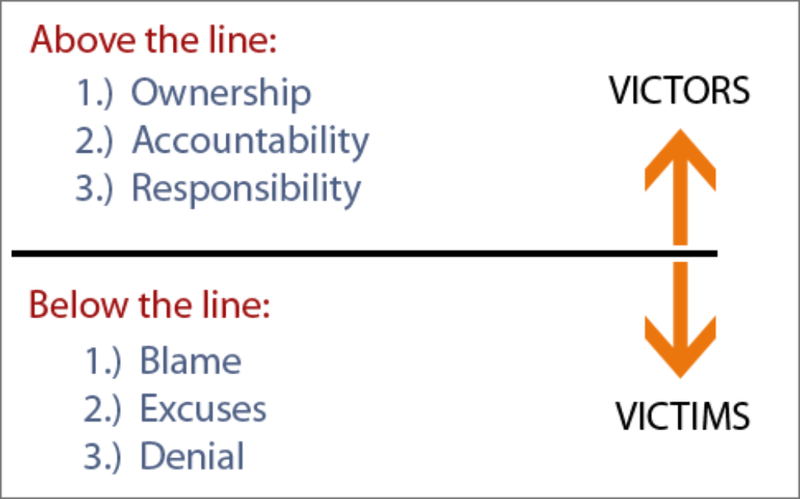 The fine line is about understanding impacts of the mistakes that "can" be made and managing those and the chance of them happening. If you are reading this as a Team Leader, then this is all vital information to have and lead by. By putting in active levels of support (think about when you take a kid ten-pin bowling - you can put up the stoppers to prevent gutter-balls), by ensuring your people have the right tools to do their job, you consider what errors they "could" make, ensure you provide clear and concise information and help them find the drive to get things completed to the expected standards. This is the key towards empowerment. You technically allow them to try. The better you get at empowerment, the more effort they will put in. The more they try and take more ownership, the more mistakes they "could" make. The pay off is they will learn more lessons and be better at what they do. The better they do, the better your team performs. The better your team performs, the less you have to manage them. The less you have to manage them, the more you get to look for opportunities to challenge them even further, make their work life fun and improve how your entire section of the business performs. Do you see how it all flows into one another? By ring-fencing mistakes, they quickly become "exceptions" to the normal day to day and therefore kept minimised and controlled. The benefits gained from allowing your people to make them, are massive. Your role as a team's leader is to provide them a safety net. You need your people to own up to any mistakes they make, and then ultimately learn from them. You do this by leading the way, by building better relationships with them. You also need to provide yourself with permission to try and potentially fail too. If your team see you trying, you will inspire them. There are a few other features that "Failure" has in store for most people that as a team's leader, are important factors to consider in your (and their) journey. Failure is often emotionally charged. A factor that stops people in their tracks. Embarrassment can play a big factor. Right now I'm betting you're thinking of embarrassment being a feature of your own journey as for a solid reason NOT to have tried things in the past, right? Rest assured, it's a common factor for most of us. Including those you are leading. If you want your team to succeed, then you will have to take the bull by the horns at some stage, accept that embarrassment is an acceptable part in making mistakes and put yourself out there by trying and failing too. In every case where you error, you will have the ability to choose how you react. And this is something you can teach. As the leader, in showing you are willing to try and fail, your team will see a vulnerability that will humanise you and be right up there with the other important leadership traits as Trust, Empathy and Approach-ability. Give it a go - after all, what's the worst that could happen? You fail? Not a big deal, right? An easy exercise to help. "Often when I fail, I..."
1. ...wallow in self pity, and beat myself up for my dumbness. It haunts me. 2. ...get embarrassed, shut down and refuse to try again. 3. ...blame everyone else except me, just to deflect the blame. If you answered "No, I don't do that" to the first three and a firm Yes! to the forth, then congratulations! You're well on your way. To help your team members (and yourself) deal with any other answers, an easier thing to do is change the starting question. You add two simple words. "Often when I fail, I choose to..."
The addition of the two extra words can provide the opportunity for you and your team member to discuss the choices each of us have, especially when dealing with failure. As always, it is on you to lead the way, to help your team be better, to change their views and lead them toward a more positive approach. Get your team above the line through getting them to genuinely answer "No" to the first three questions and a firm "Yes" to the last one. By dropping the bowling alley barriers to stop gutter-balls, and assisting them to see the benefits to failure and effort, you empower them to grow. There is no greater feeling as a leader than seeing your team succeed. As always, if you have any questions, please add them into the comments.